This masterfully crafted knee-hole desk, or bureau Mazarin, is attributed to Pierre Golle, one of the finest and most important French cabinetmakers of his age. It was once part of the famed Rothschild collection at Mentmore, which is said to have been one of the finest ever assembled in private hands, aside from the collections of the Russian and British royal families. Another marquetry table by Golle from the collection of Mentmore is currently on display in the Metropolitan Museum of Art. Larger in size than the Met's table, the present desk is perhaps even more impressive in both its design and execution - it is truly museum quality in every regard. 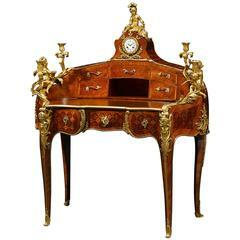 The superb piece is enveloped on all sides with phenomenal marquetry of stained and natural woods. From the scrolling foliage and intertwined strapwork to the theatrical masks, birds, butterflies, and flowering plants, each opulent decorative motif exhibits the utmost artistry. A very similar knee-hole desk by the legendary André-Charles Boulle - Golle's son-in-law - can be found in the collection of the Carnegie Museum of Art. Originally a 10th century Italian technique, marquetry was first introduced by Golle in France in the late 17th century. 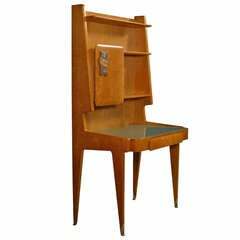 The aesthetic effect is achieved by veneering furniture with various types of woods that have been cut and pierced into elaborate floral and curving designs. These minuscule pieces of wood were colored or scorched with hot sand to create subtle gradations of shadow. Today the most splendid and sumptuous specimens by Golle are diminishing in number due to the ravages of time, light exposure, and variations in the atmosphere. 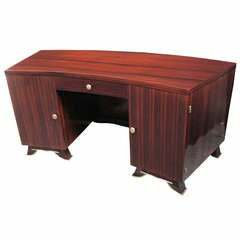 This desk, however, has been impeccably cared, retaining its vivid oranges, reds, yellows, and greens throughout. 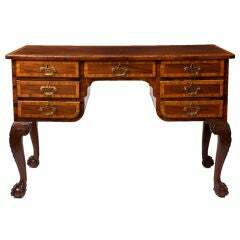 Formerly under the employ of Cardinal Mazarin, for whom this desk is named, Golle supplied marquetry cabinets to the King and the Grand Dauphin at Versailles and other royal châteaux. He also created a marquetry floor for the Grand Dauphin’s Cabinet Doré, which has since been destroyed, for an incredible 7500 livres. Through his son Corneille, who immigrated to England in 1685, Golle’s designs influenced Gerrit Jensen who supplied marquetry furniture to the court of William and Mary. 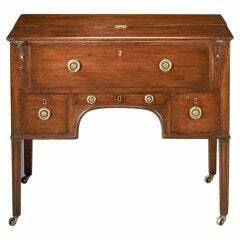 Provenance: Rothschild or Mentmore Collection at the Mentmore Estate, circa 1680 Measures: 46 1/2” wide x 27 1/2” deep x 31” high. 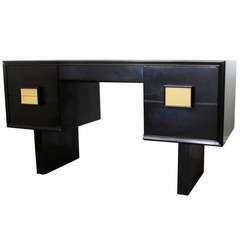 A unique partners desk comprising of white and brown formica on a black metal frame with brass sabots. There are 2 drawers to the front and rear. 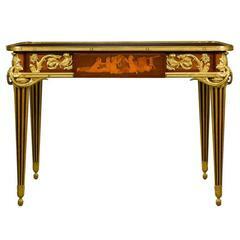 A fine Art Deco desk attributed to Jules Leleu.